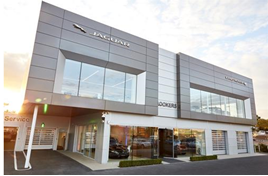 Lookers has celebrated the opening of its £12 million Jaguar Land Rover West London dealership with the first debut of the new Land Rover Discovery, outside of a motor show. Customers and Jaguar Land Rover VIPs were joined by special guests explorers Sir Ranulph Fiennes and Monty Halls. Jaguar Land Rover UK managing director Jeremy Hicks and Lookers chief executive Andy Bruce played host. Bruce said: “Our new showroom is the result of a £12m investment into a brand that we really believe in. “Our business is doing better than ever thanks in no small part to the incredible array of Jaguar Land Rover products on sale. Hicks said: “Jaguar Land Rover continues to enjoy great success at the moment; this month has been our best September on record for both Jaguar and Land Rover. “With world-class additions like the new Discovery to our line-up, it’s important that all our retailers embody the spirit and quality of our vehicles. Lookers West London is the perfect example of just that; it’s customer-centric, stylish and full of all the very latest models in our range." Lookers West London has room to display 20 Jaguars and 18 Land Rovers. It also has two handover studios, where customers can see their cars unveiled, before driving straight out of the showroom, a drive-in service area and features a barista bar, ‘kids zone’ and lounge-style waiting area. More than 1,800 Jaguar Land Rover sites globally will be updated with the new design, which brings Jaguar and Land Rover marques under one roof.